I’ve been a little quiet online for a while and that’s because I have decided to make a start on my 88 days regional farm work which will enable me to apply for another year’s visa in Australia, should I want to do so. I’m currently living in a shared house on a farm in Shepparton, about 2 hours north of Melbourne. I visited a few places after North Stradbroke but felt somewhat under pressure to get going on these 88 days as soon as possible. The whole process of finding a job, travelling to said job and ultimately working that job was an experience in itself (and is ongoing). It’s actually proved pretty hard to put into words and I currently have page after page of sarky/moany/angry notes shoved down the side of my bed ready to be compiled into an actual post (you may just get a blog of sarky notes in a couple of weeks!). As I’ve managed to connect to the (diabolically poor) wifi in the house today, for the second time since arriving 10 days ago, I thought I might aswell share a few photographs from before my imprisonment employment on the farm as a snippet of what I was up to. I will do my best to post a couple of images over the next few weeks when the wifi permits it! 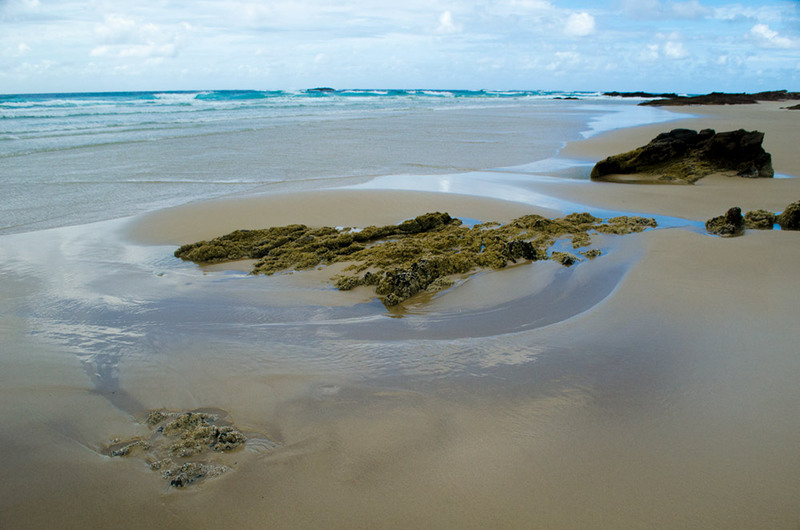 Main Beach and Deadman’s Beach on North Stradbroke Island. 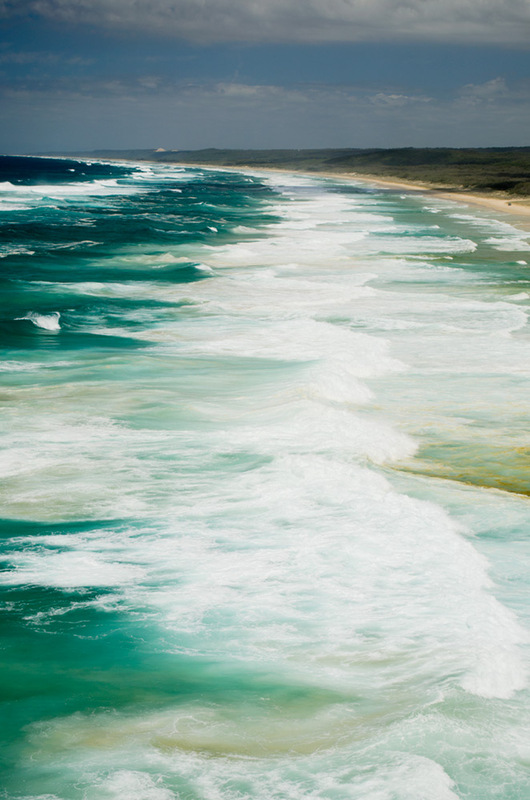 The colour of the sea was incredible while I was there, however because of recent storms that had hit the island the waves had really churned up the sand in places and the water looked rough which made some parts of the coast appear quite formidable. I was assured though that usually these gully’s and creeks are calm enough to swim in and you’ll often be joined by a Manta or a Turtle in the still turquoise waters. Natural Bridge Glow-Worm Colony in Springbrook National Park. 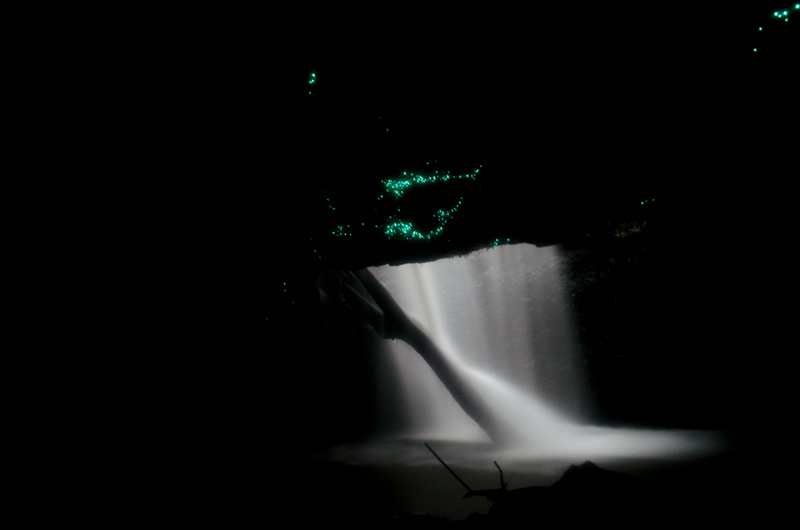 After our walk around Purling Brook Falls we drove around 40 minutes to another location within the National Park where a natural colony of glow-worms can be viewed after dusk in the waterfall’s cavern. As the sun went down thousands of huge fruit bats flew from the cave as though making room for the handful of spectators who were keen to get inside. I knew I was unlikely to manage a photograph with no tripod, but I took my camera along anyway and once there decided I wasn’t leaving until I had at least one image which showed the glow-worms! Balancing the camera on the handrail inside I managed one shot of the waterfall and glow-worms before darkness completely swallowed the cave and there was no hope! 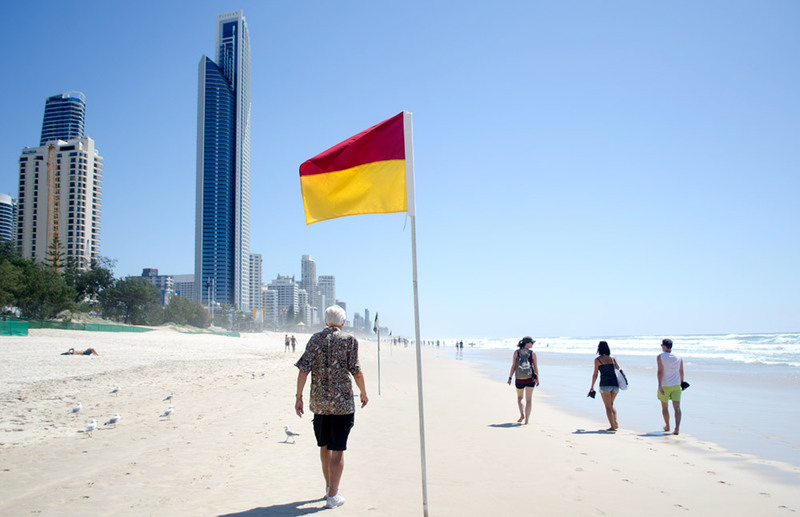 Surfers Paradise Beach. We stayed one night in Surfers Paradise during our flying visit to the Gold Coast and spent the morning exploring the beach and town centre a little before heading to Tallebudgera Creek for a much needed swim in the blazing afternoon sun. 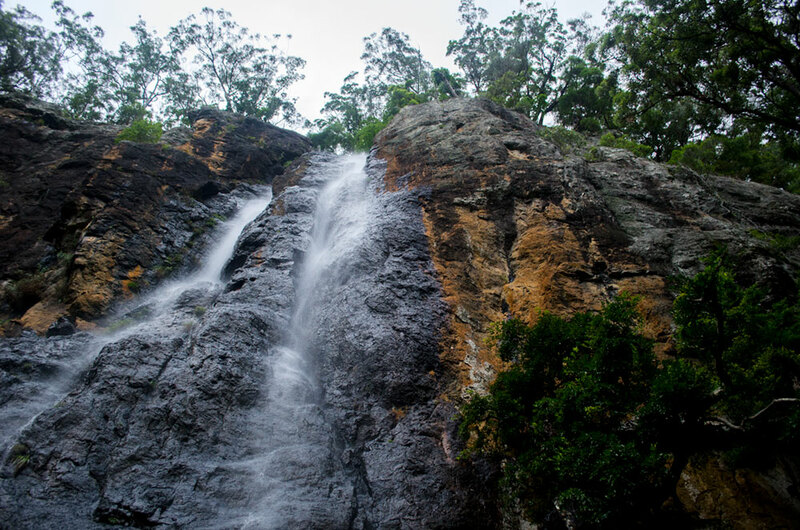 What struck me about the couple days on and around the Gold Coast was the names of places- as if ‘Surfers Paradise’ isn’t unimaginative enough there is a lookout in Springbrook literally titled ‘Best of All Lookout’ , presumably because it is the best lookout? The place names in Australia are very telling of the countries newness (in European terms at least). Storm passing over Brisbane by night. It was pretty strange to be sitting next to a pool in just my swimming costume feeling nice and warm watching fork and sheet lightening illuminating the skies over Brisbane. In this photograph, Storey Bridge is lit green in honour of St Paddy’s day. I love reading your entries on where you’ve been and the sights you’ve seen. I’m actually on the Gold Coast with a working holiday visa myself. I’m on my own, I just moved here from Canada. 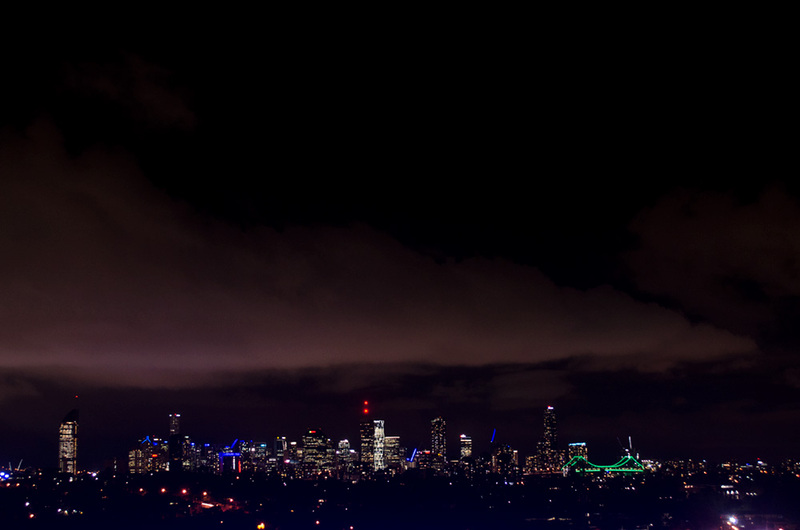 But I’d love to see something like the Brisbane city skyline at night like you did. Is there any chance you could tell me where it was that you were sitting so I could hike up there and take a look?